[PHI]240 Meter Only These portable meters are ideal for production and field use and designed for true one-handed operation to simplify use under the most extreme conditions. The LCD displays results, temperature, status messages, and icons. Tactile keyboards allow easy and convenient operation. Meters can be operated on batteries or with the optional AC adapter. When operating on battery, the automatic power shut-off becomes active. The [PHI]240 meters provide temperature-compensated pH results when used with a 3-in-1 electrode or an ATC probe. They offer fast and easy one- and two-point calibration with Auto-Find* automatic buffer recognition for five buffers (pH 1.68, 4.00, 7.00, 10.01, and 12.45), as well as Auto-Read* for locking onto stable readings. The [PHI]250 meters add five alternate buffers (pH 6.86, 7.41, 9.18, and 11.88) that may be used in addition to the standard buffers. The meters feature continuous display of calibration buffers. Temperature may be displayed in either °C or °F. The [PHI]255 meters have all of the features of the [PHI]250 meters with added waterproof protection. The [PHI]260 meters have all of the above features of [PHI]250 meters plus audible support that may be switched on or off by the user. Up to 100 data sets can be stored for later recall, printing, or transfer to a computer via the RS-232 interface. 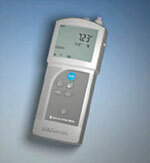 Meters offer GLP/GMP features such as date and time stamp for each calibration and measurement, link of each result to the appropriate calibration data, and printouts of calibration headers for each group of samples. A visual and audible recalibration alert after a user-specified time assures accurate results at all times. The [PHI]265 meters have all of the features of the versatile [PHI]260 meters as well as waterproof protection. The [PHI]295 meters have all of the features of the [PHI]260 and [PHI]265 meters as well as five custom buffers and ISE capabilities. UL and C-UL listed. CE marked. The [PHI]260 and [PHI]265 meters are GLP/GMP compliant.